General Electric (GE) posted 2018 fourth quarter results that were viewed positively by the financial community primarily because there were no new major negative surprises. Although management gave an update on the company’s recent progress and certain aspects of its outlook, it declined to give specific guidance on 2019 earnings. It did not set a date for CEO Larry Culp’s presentation to the financial community. Mr. Culp said that 2019 should be viewed as more about the “how” than the “how much,” suggesting that the investment community should focus more in 2019 on the company’s achievements in addressing organizational, structural and execution issues and less on earnings. This is a clear indication that 2019 will be another “reset” year. The company reported GAAP earnings from continuing operations of $666 million or $0.08 per share and adjusted earnings of $1.44 billion or $0.17 per share. That compares with a 2017 fourth quarter loss of $1.29 per share and adjusted EPS of $0.43. Consolidated revenues increased 5% to $33.3 billion, with strong 20%+ gains in Renewable Energy, Aviation and Transportation substantially offset by a 25% decline at Power. Segment profits at GE’s Industrial businesses declined 6% from $2.77 billion to $2.62 billion, as a $0.87 billion loss at Power and declines in Renewable Energy and Transportation more than offset improvements at the remaining industrial businesses. GE’s industrial free cash flow, excluding pension contributions and deal taxes, declined 29% from $6.8 billion to $4.9 billion, but this was better than anticipated. GE’s free cash flow has been a major concern of the investment community. Power. According to management, Power is still being hurt by poor execution and inefficient operating practices on equipment projects and transactional services (i.e. services that are not provided under long-term contracts). Mr. Culp said that the turnaround at Power is still “in the early innings,” which is disappointing since the segment’s problems were first disclosed more than 20 months ago. Under Mr. Culp’s leadership, the Gas Power business (equipment and services) was separated from the remaining Power businesses (i.e. Steam, Grid Solutions, Nuclear and Power Conversion) and Power’s corporate headquarters function is being consolidated in an effort to reduce cost and improve operating efficiency. Early in the fourth quarter, GE Power acquired Alstom’s interests in two joint ventures: a grid technology joint venture and a global nuclear power and French steam power joint venture, as required under a previous agreement. Thus, the restructuring of GE’s Power business is continuing. Costs for the separation of the Gas Power business, the consolidation of Power’s headquarters and the integration of the Alstom joint ventures will likely affect Power’s 2019 results. GE is now preparing for global gas power market gross capacity additions of between 25 and 30 gigawatts annually, a sharp decline from the 50+ GW of annual demand seen a few years ago and well below the projected 68 GW increase in capacity (through 2040) forecasted by the IEA in its 2018 World Energy Outlook (referenced in a report by GE). Although GE obviously believes that demand will improve eventually, it recognizes that it must align its capacity to current and expected near-term industry conditions. 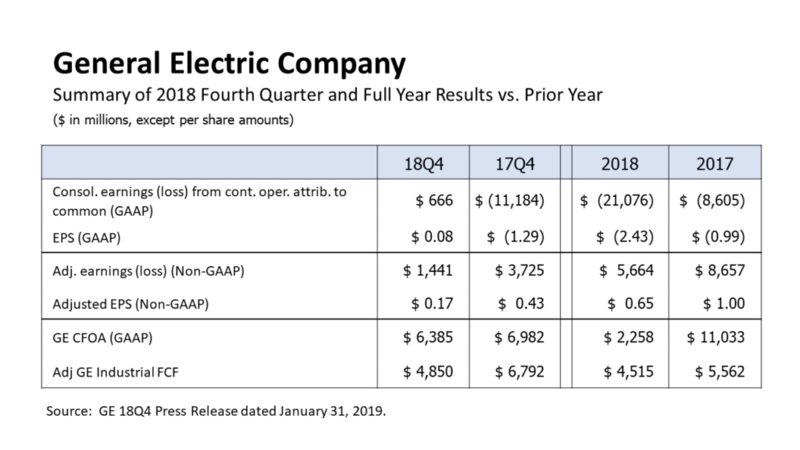 In its fourth quarter earnings report, GE disclosed that Power’s free cash flow was -$2.66 billion in 2018. The business also posted a loss for the year of $808 million, including a $200 million charge related to an oxidation problem on HA and 9FB system turbine blades and $400 million of project-related charges. I estimate that a chunk of the negative free cash flow was probably due to cash payments for previously recognized restructuring charges, warranty costs and other liabilities. Management said that as Power’s progress billings declined along with the project backlog, payments for accounts payables increased. The increase in Power’s losses during the second half of 2018 is a sign of more to come. With the decline in its backlog, losses will most likely continue for at least the first half of 2019 and then hopefully begin to decline in the second half. If so, Power’s full year loss will be greater in 2019 and its free cash flow will probably be negative. Insurance. A notable positive surprise in the quarter was the small $65 million after-tax charge recorded by GE from the completion of its GAAP-basis loss recognition testing for its legacy insurance operations. On the conference call, however, management said that it was still in the process of completing these tests for statutory purposes, the results of which would be released within the next two or three weeks. That leaves the door open to a potentially greater insurance-related charge in the 2019 first quarter. In its supplementary data package, GE disclosed that its insurance business posted a loss of $42 million for the quarter, down from the loss of $84 million recorded in the third quarter. That third quarter loss was due to a sudden sharp increase in claims, prompting management to warn of another possible charge when it completes its reserve testing. Based upon the disclosures contained in the 2018 third quarter 10-Q, I estimated that GE would take a reserve charge of $1.5 billion. The decline in the fourth quarter insurance loss to $42 million suggests perhaps that the statutory charge will be lower than my original estimate. For now, I am sticking with that $1.5 billion estimate, even though it does seem high based upon management’s comments. Any significant increase in the reserves may require GE to raise its annual capital contributions above the $2 billion planned over the next six years (through 2024). However, CFO Jamie Miller said that there is no change to the company’s original plan to contribute $2 billion to insurance in 2019. If GE does take another insurance-related charge when it announces the results of the statutory tests, its size will be determined by the assumptions that GE makes for future claims and other factors. Management could, for example, decide to incorporate more conservative assumptions to reduce the possibility of incurring big charges in future years. In conjunction with its upcoming announcement, management also said that it will expand its 10-K disclosures for the legacy insurance operations. While expanded disclosures will help analysts estimate future charges, they will also hopefully help to convince the investment community that GE does not have significantly greater exposure to losses from these obligations in the future. According to GE’s supplemental disclosures, GECAS earned a segment profit of $1.2 billion, accounting for 84.1% of the total profits of the Verticals (i.e. the finance businesses that support GE’s industrial businesses). GE Capital’s legacy insurance operations are now included in the Verticals. Offsetting the profit from the Verticals were GE Capital corporate costs, interest and other financial charges, a benefit from income taxes and preferred stock dividends. Excluding the preferred stock dividends, GE Capital essentially broke even in 2018. For the time being, GE Capital needs GECAS’s earnings in order to run the rest of the business and continue to meet its ongoing obligations. Other GE Capital Issues. General Electric adopted the GE Capital Exit Plan in April 2015. Under that Plan, its goals were to 1) spin off Synchrony Financial; 2) reduce its capital (i.e. ending net investment) by $200 billion through asset sales and 3) retain the Verticals. Although the Plan was substantially complete by the end of 2017, the company continues to explore ways to reduce further its investment in GE Capital. In 2018, for example, it set a goal of $15 billion of asset sales and decided to exit Energy Financial Services, which primarily supports Baker Hughes GE. Although GE will continue to look for ways to reduce GE Capital’s assets, it is now clear that most of what is left at GE Capital will remain with GE for the foreseeable future. GE has reportedly received “inbounds” (i.e. expressions of interest) in its legacy insurance operations; but any sale would almost certainly required GE to pay the acquirer as much as the present value of the remaining $12 billion of planned capital contributions. Under present circumstances, GE probably would not consider making such a move until it raises the necessary cash from its planned spin-offs of Transportation, Oil & Gas and Healthcare. With $40 billion of assets at GECAS, another $40 billion in insurance and nearly $19 billion of corporate assets (mostly cash and equivalents), nearly $100 billion of GE Capital’s total $123 billion of assets (as of Dec. 31, 2018) – equal to nearly one-third of GE’s consolidated assets of $309 billion- should be included in GE’s ongoing operations. In fact, the company acknowledged GE Capital’s permanent presence in its disclosures. For example, it no longer reports EPS for the industrial businesses plus the verticals. Going forward, GE’s primary financial metrics should be based upon its consolidated financial results. If I am correct, I think GE should formally announce an end to its GE Capital Exit Plan. In conjunction with that announcement, it should discuss its plans and objectives for GE Capital going forward. I would also like to see improved disclosures on GE Capital’s operating and financial performance. As noted on the fourth quarter conference call, Capital is very different from GE’s industrial businesses. Yet, GE provides the same financial metrics for GE Capital in its MD&A’s disclosures as it does for the industrial businesses. True, there is much greater detail about Capital in the notes to its financial statements, but there is virtually no accompanying narrative in the MD&A to explain Capital’s performance. In recent years, that MD&A narrative has focused on asset sales with no discussion about the financial and operating performance of each of GE Capital’s segments. Improving disclosure for GE Capital is important because many investors see it as a “black box:” a risky business that can produce big negative surprises that are nearly impossible to predict. GE’s current policy of limited disclosure serves to confirm that view. Besides GE Capital, I believe that the MD&A narratives for the industrial businesses – especially for Power – can and should also be improved. In my opinion, the limited MD&A disclosure contributes to the perception that GE is opaque, as suggested by Mitchell Friedman of Canyon Partners in the latter half of a recent interview with Bloomberg. Stepped Up Efforts to Conserve and Raise Cash. Under Mr. Culp’s watch, GE has taken several notable steps to either reduce its cash expenditures or raise more from asset sales. In October, the company cut the quarterly dividend $0.12 to $0.01, saving approximately $4 billion per year. In November, GE sold 101.2 million of its holdings of Class A BHGE shares (including 9.2 million shares reserved for the underwriters’ overallotment) for net proceeds of $2.28 billion. In January, it restructured the terms of the GE Transportation-Wabtec merger to provide $2 billion more value to GE (and $2 billion less to its shareholders). Changes to the Wabtec-GE Transportation Merger. Under the terms of the revised transaction, GE will receive 49.2% of the combined companies’ shares, down from 50.1% originally. It will now distribute a 24.3% stake in new Wabtec to its shareholders, down from 40.2% previously. As a result, GE will hold 24.6% stake in new Wabtec – including equity and a convertible preferred – up from 9.9% previously. It will also receive a $2.9 billion cash payment as originally planned. With these changes, GE will receive $3.4 billion of new Wabtec common and convertible preferred stock, up from $1.4 billion of common, under the original terms of the deal. It must hold on to these securities for 30 days, but it is required to sell them within 3 years. On Feb. 5, GE announced details of the transaction. GE shareholders will receive .005403 shares of Wabtec (WAB) for every GE share that they own. Under that formula, a GE shareholder would have to own 185 shares of GE to get 1 share of Wabtec. By my calculations, based upon Wabtec’s Feb. 7 closing price of $73.23, each share of GE will receive $0.40 cents worth of Wabtec. No fractional shares of WAB will be issued; GE shareholders will receive cash in lieu of fractional shares. The Sale of BHGE Shares. As noted, GE sold 101.2 million Class A BHGE shares at $23 each in a public offering on November 14, for net proceeds (after underwriters’ discount) of $2.28 billion. The sale reduced GE’s interest in BHGE from 62.5% to 50.4%. With the sale, GE signaled that it is ready to reduce its stake further, as long as market conditions remain favorable. The sale came one month before oil services stock bottomed, prompting some to suggest that the offering was a fire sale. Since the equity sale, BHGE stock has rebounded modestly to $24.39, which has probably made investors who participated in the offering happy. With its equity stake now at 50.4%, GE will continue include BHGE in its consolidated results. However, since the next public offering will certainly bring GE’s ownership stake below 50%, BHGE will be deconsolidated from GE’s financial statements. At the current price of BHGE shares, GE’s remaining 50.4% equity stake is worth $6.3 billion. The Spin-Off of GE Healthcare. Mr. Culp confirmed GE’s plan to spin-off its Healthcare business, but it is not clear whether the original proposed terms, which were somewhat sketchy to begin with, have been changed. The currently contemplated transaction includes the transfer of $18 billion of debt and pension liabilities and the sale of up to 50% of the equity. Previously, I had assumed that all of Healthcare would be spun off eventually; but that the process would start with an IPO of 20% of the equity, followed by several distributions (or swaps) of shares to (or with) GE shareholders over several years. It is not entirely clear whether this latest iteration – the sale of less than 50% of the equity – is the ultimate goal or a step along the way to a full separation; but it does now appear that GE is contemplating hanging on to 50% or more of the business for the time being, which will keep Healthcare in its consolidated results. Settlement with DOJ. GE announced that it has reached an agreement in principle with the U.S. Department of Justice to settle the FIRREA investigation into the mortgage underwriting practices of WMC, a discontinued GE subsidiary. The company has agreed to pay a $1.5 billion civil penalty, which is the amount that it had reserved for this matter in the 2018 first quarter. De-leveraging the Balance Sheet. GE’s primary goals, as articulated by Mr. Culp, are to de-leverage the balance sheet and strengthen the businesses. Actions taken during 2018 – the dividend cut, $5.9 billion of Industrial dispositions (with $9.7 billion more to come with the spin-off and merger of GE Transportation on Feb. 25) and $15 billion of asset sales at GE Capital – helped reduced GE’s consolidated borrowings by $24.6 billion from $134.6 billion in 2017 to $110.0 billion in 2018. GE Capital repaid $21.0 billion of external borrowings, reduced its outstanding commercial paper from $5.0 billion to zero and ended 2018 with $15 billion of liquidity. The company is targeting a net debt-to-EBITDA ratio of less than 2.5 times for its Industrial businesses over the next few years. I estimate that ratio to be about 6.7 times at the end of 2018, with $19.7 billion of net debt, equal to $32.3 billion of industrial borrowings minus 75% of its $16.3 billion of cash divided by $3.0 billion of EBITDA. (This calculation excludes $13.7 billion of net borrowings of GE Capital that are attributable to GE.) A more conservative calculation of this ratio, which includes pension liabilities, operating leases and a portion of preferred stock, puts GE’s Industrial net debt at $55 billion and the ratio at 18.3 times. GE is also targeting a debt-to-equity ratio of less than 4.0 times for GE Capital by 2020. I calculate that ratio to be 7.0 times at the end of 2018, including the debt assumed by GE but excluding the intercompany payable to GE. Over the next two years, GE expects to raise additional cash from asset sales, including more than $30 billion from the sales of its stakes in Transportation, Oil & Gas and Healthcare and at least $10 billion from GE Capital. Those sources will be used to pay down the debt and other support that GE assumed from or provided to GE Capital. In October, GE’s debt ratings were downgraded from A to BBB+(Baa1) by Standard and Poor’s and Moody’s (with stable outlooks). Management said that the downgrade went smoothly with minimal additional postings of collateral (on derivatives contracts) and an easy transition to a Tier 2 commercial paper program. With its debt reduction goals, the company is targeting an eventual return to an A rating. Another Reset Year in 2019. With the turnaround at Power still a work in progress and ongoing efforts to reduce overhead costs and debt, 2019 will likely be another year of “below potential” performance for GE. The company also expects to make some non-recurring payments related to certain investments, settlements of liabilities and changes to its financing practices which will negatively impact its free cash flow in 2019, but set the stage for improvement in 2020 and beyond. On the conference call, management provided guidance on certain key performance metrics for many of the industrial businesses for 2019. It expects a low- to mid-single digit increase in revenues and operating margin expansion in the Industrial businesses, even with the drag from Power. Still, it declined to offer more specific guidance on consolidated results, as it typically does. I had expected that management would set an early February date for the CEO’s annual 2019 Outlook presentation to the investment community; but it declined to set any date for that meeting because there are still considerable uncertainties that need to be resolved before it has sufficient confidence to confirm the outlook. Valuation Analysis Challenges. 2019 will also present certain challenges (for me and perhaps other analysts). Although I continue to believe that GE’s stock trades at a significant discount to the inherent value of its businesses, it will likely be more challenging to demonstrate that in 2019. The primary reason for this difficulty, if I am right, will be the weaker expected performance at Power. If Power reports a loss for the year, its EBITDA will also likely be lower, perhaps close to zero. Consequently, in order to make an accurate assessment of Power’s value, analysts will have to assess its sustainable profitability once the business stabilizes and its growth prospects. Such an analysis will probably require investors to acknowledge that the business is worth a relatively high enterprise value-to-2019 EBITDA multiple, based upon assumptions that many may consider speculative. The market may be unwilling to award that higher multiple to Power until there is clear evidence that it is returning to profitability. I currently plan to update my valuation analysis for GE after the company files its 2018 10-K. This entry was posted in GE, Industrials and tagged General Electric. Bookmark the permalink.